Around your house, some things are easier to get rid of than other things. You can fill up your trashcans with all the garbage you create in a week. Yes, there are those occasions when you have to deal with garbage overflow but for the most part your trashcans can hold what you need to toss out on a regular basis. What about the bigger things? Where can you turn to for something like a backyard shed removal? The answer: the company who’s been doing this kind of work for the past 12 years. Junk King Portland is part of a national chain of professional junk haulers who have been dedicated to keeping homes clear of rubbish since they began business back in 2005. The owners of Junk King started the company when they themselves couldn’t find professional junk haulers to take care of their unwanted clutter. Now those businesses have spread across the country and into Canada. It is become the leading junk hauling service in every city that sets up a franchise. Here in Portland, Junk King follows the same model of providing exceptional customer service and responsible junk hauling. 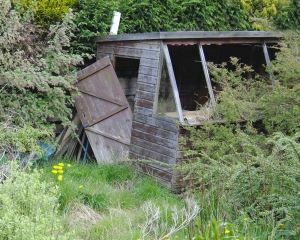 As for your backyard shed removal, this is the type of work that is perfect for Junk King. You’ll be provided with a two-man moving crew and a truck big enough to haul away whatever you want to get rid of. It will be that crew who will be dismantling your shed in order to loaded onto the truck. This might seem like “above and beyond the call of duty” type of work that is exactly what Junk King does every single day. Loading a few pieces of furniture and some old boxes doesn’t take a lot of time. However, when you’re dealing with a backyard shed removal you have to be careful with dismantling those pieces. You don’t have to worry about be in charge extra for the labor. It’s all included in the flat fee. That fee is based upon how much room all your stuff will fill on the back of the truck. You’ll know this price before the work begins and it’s a very fair way of doing this kind of work. When you want to take care of backyard shed removal or junk hauling the only call to make is to Junk King Portland. This entry was posted in Portland junk removal and tagged Backyard shed removal, junk, rubbish on August 29, 2017 by Junk King. Last updated August 29, 2017 .